Peebles Homes plans to sell 36 new construction single-family residences on the 8.4 acres of land they purchased from the City of Kettering. Home sites can be seen on the map above. Information regarding the proposed single-family homes can be found on the website for Peebles Homes. The starting price of the new homes is in the mid-$200,000s. 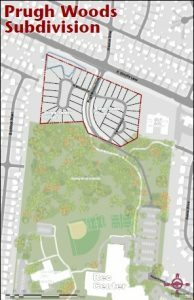 The Prugh Woods development includes a new access road to the Kettering Recreation Complex from East Dorothy Lane, which will be named Prugh Woods Drive. A multi-use pedestrian/bicycle pathway will be constructed along Prugh Woods Drive with a connection to Westcott Drive. It is important to note that the City did realign the placement of the roadway in response to resident concerns shared at the Community Meeting held in April 2015. The roadway is now 100-200’ away from the rear of residential properties on Revlon Drive. At this time Prugh Woods Drive will not connect to Rosewood Arts Centre, though the opportunity remains open for future consideration.